In order to win the majority, it is vital that we assemble and stay connected. The Democrats have proved time and time again that they have the advantage when it comes to organizing and effectively messaging across all social media platforms. How do you stay connected? 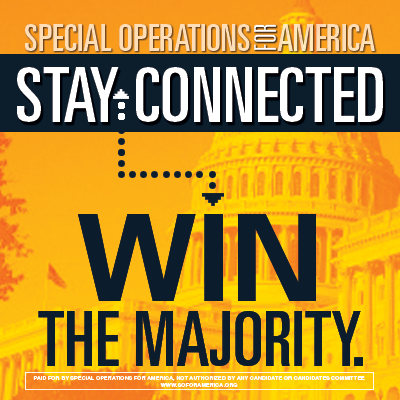 Here at Special Operations for America, we have the pulse on all the races and want to ensure that we are electing formidable candidates who will fight for our values and to take America back from the hands of an Imperial President. Stay connected with us and we will continue to work hard to elect people who will actually represent us in Congress. Find us on Facebook and Twitter, and make sure to check out our website. It's no surprise that the President has delayed his health care law...AGAIN. This latest delay marks over 30 times, the Administration has delayed it OWN law. Check out the brief history of Obamacare delays here. WASHINGTON, D.C. – Today, the National Republican Congressional Committee announced that Ryan Zinke has been elevated to ‘On the Radar’ in the NRCC’s ‘Young Guns’ program.